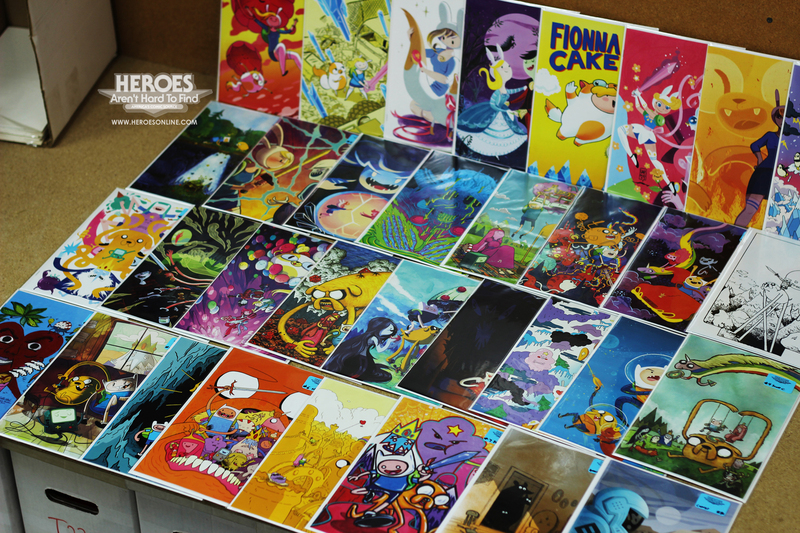 HEROESCON 2013 :: NEW STORE ARRIVALS! June 17, 2013 By: Seth Peagler Category: DISCUSS, Feast Your Eyes, Heroes Aren't Hard To Find, HeroesCon, HeroesCon News, NEWS, Now Read This! Every year during HeroesCon, we try to find time to run through Indie Island and pick up a few things we think should be in our store. This year we managed to obtain a few excellent new items that we hope you’ll consider picking up during your next visit. 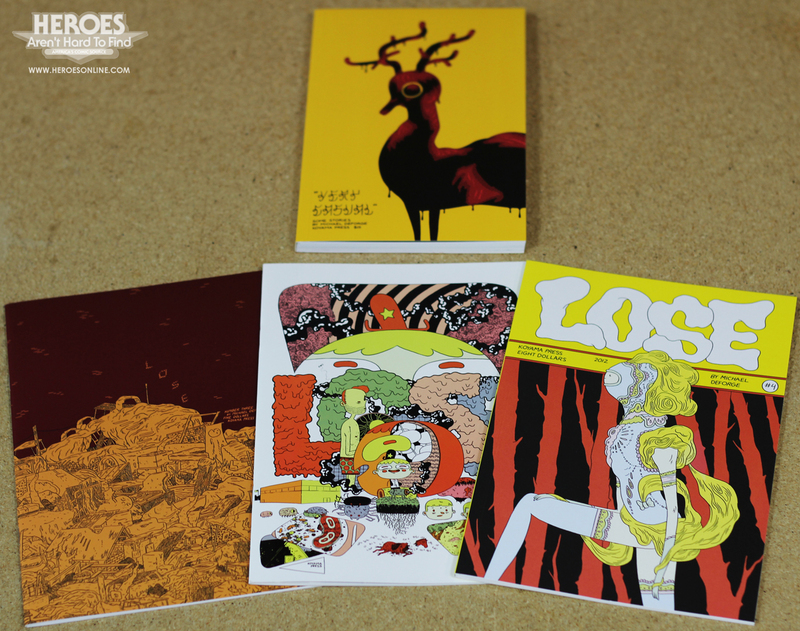 First up is an assortment of Michael Deforge books from our friends at Koyama Press. Among them are Lose #2-4 and his newest collection, Very Casual. Deforge’s art is interesting, trippy, and somehow still capable of appealing to all ages readers, as evidenced by his contributions to Adventure Time. Speaking of Adventure Time, we stopped by Boom Studios‘ booth and picked up 43 – that’s right – 43 different covers from various Adventure Time comics. More accurately, we picked up copies of Fiona and Cake #1-5, and Adventure Time (Finn and Jake) #1 – 16 plus copies of this year’s annual. And, as I mentioned, there are multiple covers for many of these issues, including sought after ones by artists like Scott C., Maris Wicks, Joe Quinones, Stephanie Buscema, the aforementioned Michael Deforge, Jeffrey Brown, James Kochalka and more! It wouldn’t be a HeroesCon if we didn’t stumble on a new small press book, and this year we found two from Galactic Press, a small Georgia-based company that introduced us to their books Galaxy Man and Hero Cats of Stellar City. These are both fun all ages titles, with Galaxy Man offering up a twist on the Father/Daughter super hero team, and Hero Cats being…well…kind of self explanatory in its title. 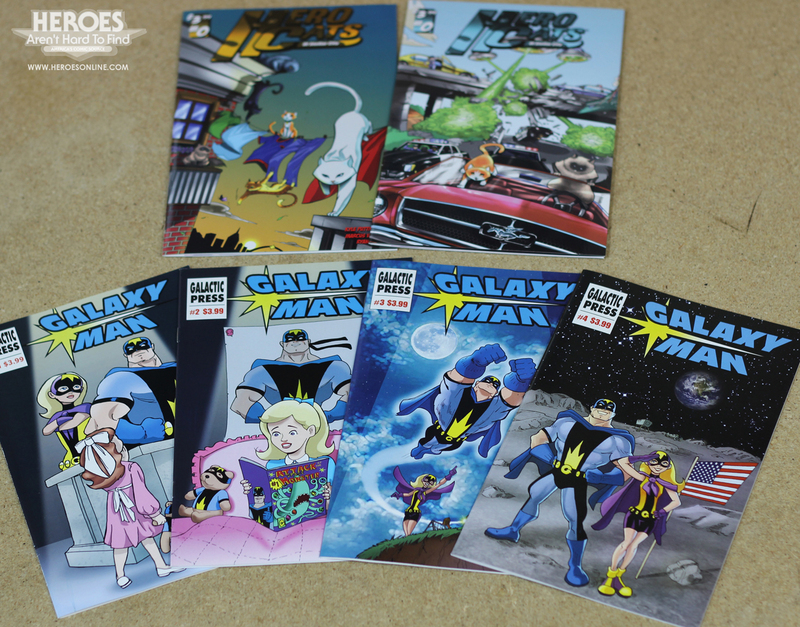 We picked these up for our young customers, so if you’ve got young readers at home who are bored with the same old kinds of all ages stories, let them take a look at these during your next trip to Heroes. As with every year, we had to stop by Adhouse Books. Not only have they been a longtime anchor of Indie Island, and not only are they really great people, but they always have fascinating books on their tables. This year we picked up another copy of the dense, epic masterpiece Duncan the Wonder Dog. We’ve had this book in the past, but I couldn’t resist. It’s really something to see and read, if you haven’t yet taken the plunge. We also picked up copies of Pulpatoon Pilgrimage by Joel Priddy (outstanding cartooning), Bumperboy and the Loud, Loud Mountain by Debbie Huey(a fine all ages book), Ace Face: The Mod with the Metal Arms by Mike Dawson (another book with an aptly descriptive title), and Nobrow’s The Wolf’s Whistle by Bjorn Rune Lie and Co. (Think a European take on nursery rhymes filtered through the lens of Wes Anderson’s The Fantastic Mr. Fox). Also at the Adhouse booth I saw recent works from the guys behind Tell Me Something I Don’t Know, one of our favorite comics podcasts. 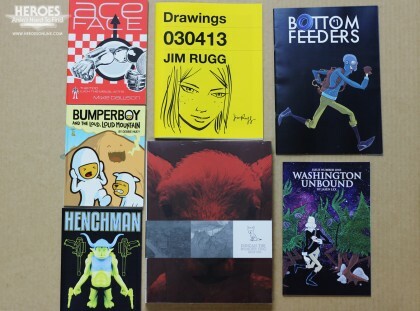 We picked up signed and sketched copies of Jim Rugg’s Drawings 030413. If you liked last year’s Notebook Drawings, you’ll love this new sketchbook. Jim continues to impress us with the virtuosity of his work, and his latest offering Supermag only solidifies the fact that he’s one of the most diverse cartoonists working today. His podcast-mate Jasen Lex also had some books on display, and we picked up copies of Henchman, Washington Unbound #1, and The Bottom Feeders #1. He’s another creator with a seemingly natural sense of design. While I didn’t pick up any new books from their podcast-mate Ed Piskor, I did see even more of his pages from his upcoming Hip Hop Family Tree. You might remember my interview with him about it HERE. Trust me when I say that this is not only the visual history of a revolutionary genre of music, but one of the finest examples of cartooning I’ve seen of late. If you haven’t pre-ordered it yet, let us know and we’ll make sure you get a copy. 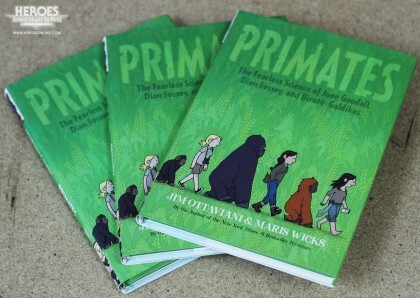 Finally, as Sunday was winding down, the talented Maris Wicks stopped by the Heroes booth and we made sure to pick up a few copies of her (and Jim Ottaviani‘s) excellent new graphic novel Primates. This book focuses on the work of Jane Goodall, Dian Fossey, and Birute Galdikas, how they changed the science of Primate study, and brought an increased awareness to these astounding animals. You can find all of these books and more in our store right now. Thanks to all these companies and creators, and be sure to pick up some of these titles the next time you visit Heroes.